President George W Bush has nominated US Deputy Defence Secretary Paul Wolfowitz as the next head of the World Bank, a key development agency. Mr Wolfowitz, 61, has earned a reputation as a "neo-conservative" hawk during his time at the Pentagon, and was a strong advocate of the Iraq war. 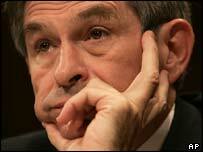 Mr Wolfowitz, described by Mr Bush as a "compassionate, decent man", said he relished the agency's "noble mission". Reaction was divided, with praise and strident criticism of the nomination. A British-based campaign group, the World Development Movement, described the nomination as a "truly terrifying appointment". Joseph Stiglitz, Nobel Prize winner and a former chief economist at the World Bank, also criticised Mr Wolfowitz's nomination. "Choosing the right general in the war against poverty will not assure victory, but choosing the wrong one surely increases the chances of failure," he said. But World Bank critic Allan Meltzer, who chaired a US congressional committee on the bank in 2000, praised the nomination. He pointed to Mr Wolfowitz's posting as US ambassador to Indonesia and experience of managing large organisations as qualifications. "We don't need a development person, there are plenty of people at the bank who do that," Mr Meltzer told the BBC News website. "What the bank needs is focus: how many children are inoculated against measles every year? What have we done to bring water to the villages? "Those are not development questions, those are administrative questions," he said. Current World Bank president James Wolfensohn had made it clear that he had wanted to continue but failed to get White House backing. He was appointed by former President Bill Clinton, and will leave on 1 June after 10 years in charge. Mr Wolfowitz and the so-called "neo-conservatives" are senior figures in and around the Bush administration who believe that America needs to be very active in pressing the case for its values around the world, the BBC's Justin Webb reports from Washington. The "Wolf" has been shown the path to the henhouse. It's hard to imagine peaceful development under his leadership. His nomination has been welcomed by International Monetary Fund head Rodrigo de Rato and UK Foreign Secretary Jack Straw. Both men praised Mr Wolfowitz's experience and said they were looking forward to working with him. Mr Straw said the US president's choice was "very distinguished and experienced internationally". But French Foreign Minister Michel Barnier was more reserved, calling the nomination "a proposal" that France would examine carefully. It is the second time within weeks that Mr Bush has appointed a hardliner to a key international post. Earlier in March, he nominated Under-Secretary of State John Bolton to be US ambassador to the United Nations - a body Mr Bolton has repeatedly derided. The World Bank numbers 184 states among its members, and is responsible for leading global efforts to promote economic development and reduce poverty. Mr Wolfowitz must be formally approved by the World Bank's executive board. In a statement, the bank said its directors were responsible for making the selection and were consulting with member countries. US appointments to the World Bank presidency are usually unchallenged, as are European nominations to lead the International Monetary Fund. But there remains the possibility of a veto similar to that used by the US to stop Europe's choice for IMF chief, Caio Koch-Weser, from getting the job in 2000.